To understand the action of sacrificial anodes for cathodic protection it is necessary to have in mind the galvanic series of metals. The galvanic series for a few selected metals in sea water are Electropositive, Platinum, Titanium, Stainless steel, Monel, Copper, Lead, Iron, cast iron, or steel, Cadmium, Zinc, Aluminium, Magnesium, Electronegative. When the tendency for metal to go into solution as metal ions increases (leaving an excess of electrons on the metal surface), i.e. M > M+ + e the metal becomes more electronegative. Thus, since zinc, aluminium and magnesium are more electronegative than steel they are increasingly able to supply electrons to the more electropositive steel when in electrical contact in water, and will effect cathodic protection of the steel surface. Clearly, if steel was coupled to copper ins ea water, steel would supply electrons to copper which would become cathodically protected, and the corrosion of the steel would be enhanced. 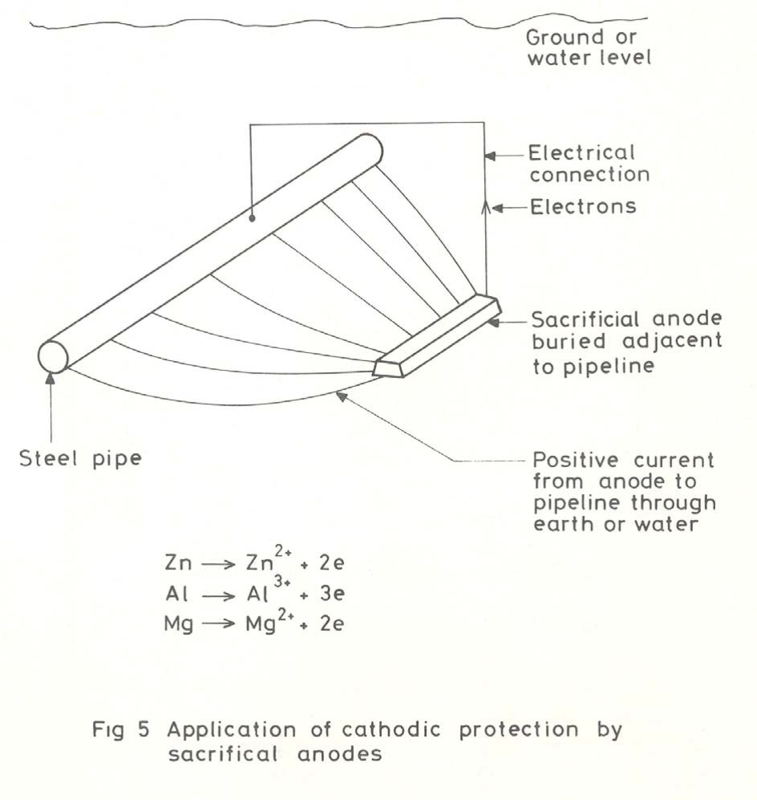 The cathodic protection of a steel pipe with sacrificial anodes is illustrated in Figure. Electrons are supplied to the steel pipe, via the electrical connection, and a corresponding amount of anode material goes into solution as metal ions, according to the laws of electrolysis. Some anode material is lost by self-corrosion, and the anodes are not converted to electrical energy with 100% efficiency. Zinc, aluminium and magnesium area the metals commonly used for sacrificial cathodic protection. Some anode properties are shown in Table below. The driving voltage of sacrificial anodes is now compared with impressed-current anodes, and sacrificial anodes must be located close to the structure being protected. Although almost any piece of zinc etc could provide cathodic protection over a short period of time, cathodic protection schemes are usually required to operate over periods of several years. Anodes can lose their activity and become passivated, developing a non-conducting film on their surfaces so that they no longer are able to supply current. This can be avoided by careful control of the concentrations of trace impurities in the anode materials, and by alloying. For zinc anodes the level of iron, for example, must be kept below 0.005% for satisfactory long-term operation of the anodes. To prevent passivation of aluminium anodes,alloying with, for example, indium has been found to be successful. The previously successful alloy with mercury is now disliked on environmental grounds.